As we age – it gets harder for our body to naturally maintain good cellular structure and function. This degenerative toll increases with time leading to the appearance of age-lines and wrinkles, decreased energy level, joint pains, and much more. That being said – there are ways to slow down or even reverse some of these signs of aging. One such way is by consuming supplements and vitamins daily to boost bodily functions and another such way is through cell therapy. Celergen captures the benefits of these two options and combines it into a single soft-gel capsule that you can take daily. It is currently the only Non-injectable Cell Therapy Supplement in the world and has been extensively studied with proven results. Here are some benefits you can enjoy by taking Celergen. The loss of collagen and skin elasticity is a major cause for the development of fine lines and wrinkles. Prolonged outdoor exposure to different types of weathers can also cause the once firmly connected collagen structure to loosen and become weak. This along with the harmful effects of the sun’s UV rays makes fine lines, wrinkles and crow’s feet more pronounced. One of the most potent ingredients in Celergen is Peptide E Collagen which rebuilds this collagen matrix from the inside out. In a study 71% of the people who took Peptide E Collagen for 28 days experienced a significant reduction in deep wrinkles. Furthermore – Celergen also helps to keep the skin hydrated, supple and radiant. Regardless of age, gender or ethnicity – arthritis is a chronic condition that makes it difficult to enjoy daily activities. In severe cases – this joint pain can make climbing a flight of stairs or even walking a seemingly impossible task. To cope with this pain – many are reliant on painkillers, steroids or even surgery. With a proven track record of recorded results – Celergen can help you start living an active and pain-free life without the need of surgery or the harmful side-effects of steroids and anti-inflammatory drugs. 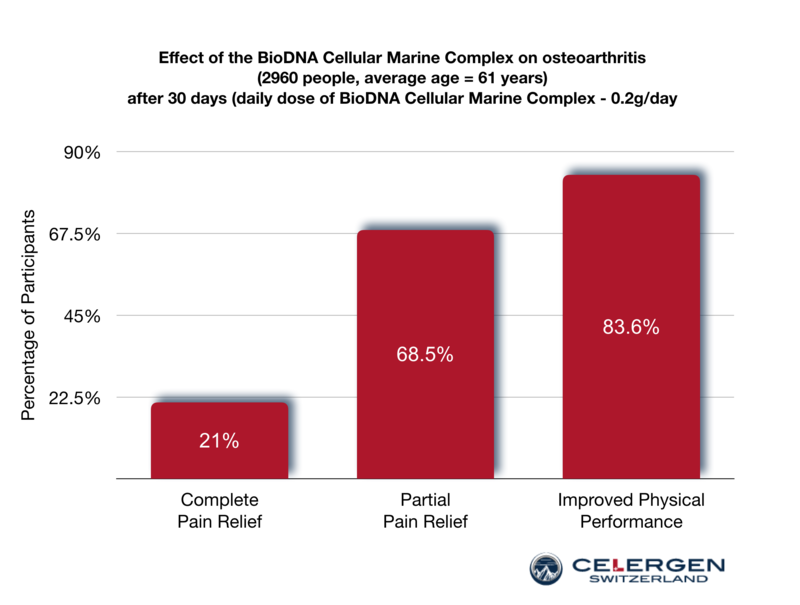 The proprietary Bio-DNA complex can help rebuild joint cartilage and improve joint mobility while decreasing inflammation. Have you ever suddenly felt tired or lethargic for no good reason? If yes, you are quite possibly suffering from chronic fatigue. In a nutshell, it is your body telling you need rest. Celergen helps fight off exhaustion and fatigue throughout the day by delivering essential proteins and micronutrients to the body at the cellular level. Just one capsule a day can lead to improved sleep quality, increased stamina, and a rise in your overall energy levels. With Celergen – there is no reason to not be energetic! If you experience any of the above symptoms associated to aging- try Celergen. Not only can it help reduce joint pains and fine- lines while boosting your energy level – but it is also proven to increase libido, decrease the body’s glycemic index and improves memory retention. A single capsule daily can help trigger and boost the body’s natural healing powers to slow down and even reverse some of the symptoms associated with biological aging.